FULL COLOR: A full range of vivid colors. MAXIMUM-SIZE: The largest print area available. ALTERNATING MESSAGES & IMAGES: Select multiple messages. FLEXIBLE ORDER SIZE: Industry’s smallest custom print minimums. Concluding Our 4-part Series on Developing Systems and Methods That Are Shaping the Future of Construction. The safety of a structure can be jeopardized by accidents, extreme loads, hidden construction flaws, wear and tear, and other vicissitudes. Until recently, the only way to tell how a structure was performing was to observe changes in the length or shape of individual structural components and calculate if they were within safe design assumptions. This could require instrumenting scores or even hundreds of locations on the structure, and a time consuming effort to collect and interpret data. Another drawback is that movement within a few components may not accurately reflect performance of the structure as a whole. Dynamic structural performance monitoring is a fundamentally different approach. It uses precise accelerometers to measure building movement in three axes, and algorithms that tease out movement patterns, oscillations called standing waves. These oscillations are fundamental properties of the structure; wave frequencies that are determined by the size, mass, and flexural performance of the structure's elements. They can reveal weaknesses and behaviors that do not match the predicted behaviors of the design, and then are used to characterize and locate problems. Instead of placing strain gauges or accelerometers at hundreds of monitoring points, STRAAM reads structrual performance with this one instrument called a Strukturocardiograph(TM), placed at a handful of points in a building, on the deck of a bridge, or on top of a dam or other structure. After 30 years of research, dynamic performance monitoring is being commercialized by STRAAM LLC. Once STRAAM has recorded a baseline dynamic signature of a building's movement, the STRAAM system can provide nearly instantaneous alarms if the structure's dynamic signature changes. It can be used to assess existing structures, for periodic or event-driven (blast, accident, natural disaster) check-ups, or to continuously monitor critical structures. It is being used in buildings, bridges and other structures around the world. Recommendation: Who else knows how to do the same thing you do, better than you do it now, and how did they get there? While our ten-best list is full of high-tech wonders, there are many places where shelter concerns are far more basic. For millions of people, the best new building product in the world might be a used 2-liter plastic soft drink bottle. With little or no access to electricity, they live in dark housing. A hole in the roof admits only a concentrated shaft that spreads little usable illumination throughout the interior. However, a water-filled plastic bottle inserted through the roof gathers sunlight and diffuses throughout the interior below. Alfredo Moser from Brazil is credited with pioneering plastic bottle skylights, and non-government organizations like A Liter of Light are spreading the light. Recommendation: When we think about progress, it is important to consider not only the leading edge, but also the trailing edge. Continuing Our 4-part Series on Developing Systems and Methods That Are Shaping the Future of Construction. 6. Advanced Fiber Reinforced Polymer CompositesThe new generation of fiber reinforced polymer (FRP) composites has been incubated by aerospace use -- composite materials account for 50% of the primary structure of Boeing's new 787 Dreamliner jets, including the fuselage and wing. As production capacity soars, prices will come down-to-earth, making architectural applications feasible. In addition to advances in carbon, aramid, and other high strength fibers, new resins and finish coatings have been developed. For example, CCP Composites offers resins that can be used for fire-resistance rated walls; their impressive strength-to-weight makes this useful in high performance environments. FRP composites also create new opportunities in form-making and new construction methods. One impressive example is the "bridge-in-a-backpack." It consists of arched FRP tubes that are made rigid by high-pressure inflation. They can easily be transported in a compact, deflated form, deployed quickly, and used as both formwork and reinforcement for cast-in-place concrete. This idea, invented at the University of Maine, is being used on a number of short and medium span bridges. Recommendation: Adaptation of materials developed in other industries can bring new solutions, but it usually requires outside the box thinking, too. The construction industry is challenged to find a way to integrate all our powerful digital tools into a cohesive process. Seeyond may be showing us the way with a clever system for tessellated partitions, ceilings, and other surfaces. What qualifies it for this list is not the product, but the process by which they connect the designer's vision with the company's digital fabrication process. Using the company's "proprietary parametric design tool," in the company's words, "the user selects the feature type, then modifies its size, form and tessellation, and finally, chooses any relief or visual effects." The tool provides feedback on material, hardware, and manufacturing requirements. It further provides preliminary structural analysis so that designers can make informed decisions earlier in their project. And since it is parametric, each change in a variable automatically modifies the relationships among other variables within the design. Seeyond then uses data from the user's design to drive the manufacturing process, creating a unique specialty feature." 1) Find info in catalog or by calling a sales rep.
2) Interpret info and incorporate into a design. 3) Prepare bid and contract documents. 4) Answer questions about bid and contract documents. 5) Interpret shop drawings to make sure they meet design intent. 1) Use the interactive design tool. That says, "Wow," to us. Recommendation: The digital workflow is on the rise, and it will not-so-gradually become the norm. It is time to make your products and services compatible with it, and take advantage of it. Quantum dots work in two directions: running power through them generates illumination, as described above, and shining light on them generates power. A research team at University of Notre Dame is developing "solar paint" that uses quantum dots to produce energy. Their goal is to create an affordable coating that can be applied to conductive surfaces without special equipment. "The best light-to-energy conversion efficiency we've reached so far is 1 percent, which is well behind the usual 10 to 15 percent efficiency of commercial silicon solar cells," explains one of the scientists. "But this paint can be made cheaply and in large quantities. If we can improve the efficiency somewhat, we may be able to make a real difference in meeting energy needs in the future." They call the technology, "Sun-Believable." Their work uses nano-sized particles of titanium dioxide coated with either cadmium sulfide or cadmium selenide. Nano titanium dioxide is already used in "self-cleaning" concrete, where it acts as a semi-conductor to convert sunlight into electrical charges that convert pollutants into relatively benign compounds. Development of solar paint may cross-fertilize with other innovations. For example, WE Energies has developed electrically-conductive concrete that, when used with the new paint, could conceivably form an electrical generating and storage system that is built into the very structure of a building. We should proceed with caution, as potential risks of nanoparticles are still being assessed. For example, the nanoparticles in self-cleaning concrete accelerate deterioration of concrete, and may be detrimental to fragile ecosystems if released into the environment through erosion or improper disposal. Recommendation: Both of the materials mentioned here are products that multi-task. It's a property often associated with the move towards greater sustainability. It's worth asking yourself if the things you make could do more than they do now. Michael recently drew your attention to the LEED Pilot Credit Library. It is full of interesting new credits to which your product may contribute. Now that the comment period for LEED 2012 is nearly over, it is time to see which of these creative new credits will be elbowing out your old favorites. You may be pleasantly - or unpleasantly - surprised. The conversion that shocked me most was the transformation of several Materials and Resources credits into a new "Material Life Cycle Disclosure and Assessment" credit. If you're accustomed to declaring your product's recycled content, you may need to make some changes to how you source that content. Recycled content will be required to come from manufacturers with closed-loop systems. That is, you, the manufacturer, need to accept your own products or similar products back into the manufacturing stream for recycling. Some carpet manufacturers have reclamation programs in place, but it may be a challenge for other manufacturers to contribute to this credit. The good news is that all kinds of disclosure and life cycle assessment (LCA) credit opportunities are part of the"Material Life Cycle Disclosure and Assessment" credit. If you know where your materials originate and what they contain, and you are willing to disclose that information, you may be able to open this credit back up for your company. Some credits substantially change: two are the "Rapidly Renewable Materials" and "Certified Wood" credits. Both are now part of "Responsible Extraction of Raw Materials." See BuildingGreen's analysis of how FSC certified wood is rewarded in LEED 2012. "Regional Materials" is replaced by "Support Local Economy". I urge you to see for yourself what advantages and disadvantages the new LEED rating systems hold for your company. By all means, comment on the changes, as they are not yet set in stone. Contact us for help with your sourcing, production and marketing strategies for LEED 2012. Aluminum was discovered in 1826, but pure metal was hard to separate from its ore. In 1855, aluminum bars were displayed at the Paris Exposition alongside France's crown jewels, which was appropriate since the metal cost about half the price of gold. 30 years later, an economical process for extracting aluminum was discovered, making it an inexpensive and commonly used metal. 100 years later, transparent aluminum was invented... in the mind of a writer for Star Trek. It was envisioned as a commonly available material in the 23rd century. Now, 200 years ahead of schedule, several forms of transparent aluminum have already been developed. In one, an immensely powerful X-ray laser knocks electrons out of aluminum molecules, rendering it nearly invisible to extreme ultraviolet radiation. This process is completely impractical in its current form: each laser pulse consumes enough electricity to power a city and the invisibility lasts only about 40 millionths of one billionth of a second. 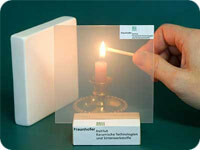 Transparent aluminum oxynitride, however, is already in use as a replacement for bullet-resistant armored glass laminates. The ceramic material is half the weight and twice the strength of armored glass. It is also twice the cost of armored glass. But that deal-breaker will probably not last long. Aluminum's history suggests that today's "completely impractical" can be tomorrow's "nothing to it." Recommendation: We used to ask, "How can we solve new problems with existing materials?" The new paradigm is, "How can we solved existing problems with new materials?" Cross Laminated Timber (CLT) has made the jump across the Atlantic and is now available in Canada from Structurlam and other fabricators. Like plywood, CLT is fabricated into panels with multiple layers of wood, each set perpendicular to adjacent layers. But instead of using thin veneers, CLT uses lumber to create panels that can be five or more inches thick. And instead of commodity 4 x 8 ft. panels, panels are custom engineered and fabricated in sizes limited only by handling considerations; plywood on steroids. The panels can create load-bearing walls or decks that are 1/6 the weight and 1/3 the thickness of concrete with similar load-bearing capability. Its building code classification as inherently fire-resistant heavy timber construction, plus its structural properties, makes CLT a viable candidate for mid-rise buildings; indeed it has already been used for nine-story buildings in the UK. Since wood sequesters carbon dioxide and is a renewable resource, CLT has good environmental bona fides. It may become even greener as it enters the US. A team here proposes to assemble CLT with interlocking dovetails, eliminating the need for adhesives. More, they propose to source wood from dead, standing trees in forests devastated by Pine Bark Beetles. This wood has low economic value, but a vast supply: millions of acres in the Intermountain West are victim of the infestation. Recommendation: This may affect your business, even if you are not in the wood industry. Climate change has a pernicious effect on the availability of water for human consumption, agriculture, and industry. Consider, for example, communities (and nations) that depend on a steady supply of water from melting mountain snow pack. With glaciers in retreat world wide, melt water can be exhausted before a hot, dry summer is over. Here are three types of responses. An alternative water source is atmospheric humidity, and new processes are reducing the energy required for condensing it into liquid water. The new AirDrop system uses photovoltaic cells to power fans that drive air through underground pipes where the air cools, condenses, and is captured. While initially proposed for agricultural irrigation, the same concept should work using the thermal mass of a structure to condense moisture. Another source is what is now call "waste water." Global Environmental Technology Services (GETS) has technology for wastewater treatment that is, compared to conventional treatment plants, odorless, takes 8 seconds instead of 20 days, does not use hazardous chemicals such as chloride, and fits on 1% of the land. Their small and fast system may allow water to be treated and reused on site, and to eliminate costs of connecting to a centralized sewage system. A third trend to watch is a growing range of products to implement a very old idea: rainwater collection. With our former water abundance challenged and price on the rise, rainwater collection is suddenly innovative. Recommendation: New products and systems may have to be implemented on a small scale at first. According to IBM, smarter buildings will be able to use resources more intelligently, which will lead to reduced costs and greenhouse gas emissions and ultimately to smarter, more efficient cities. Their Smarter Buildings team helps customers "listen to the enormous amounts of data" their buildings are generating. By listening to this data through embedding smarter technologies into the physical assets of an organization, building owners, facility managers and other stakeholders can analyze energy use to squeeze out inefficiencies. Groups of buildings will mimic living systems. Neighborhoods are the building blocks of smarter cities, which are just systems of systems—water, power, transportation, etc. Like a living system in nature, they can be highly complex, especially when considering the conglomeration of infrastructure over a city's 100- to 200-year history. In Washington, D.C., water pipes date back to the Civil War, for example. A neighborhood is a microcosm of the city; to make a city smarter, starting at the neighborhood level is more manageable. IBM is working to help the community become early adopters of smart grid technology that will electronically monitor, analyze and minimize power consumption in residential and commercial buildings—as well as of on-site solar and other clean-generation systems. Occupants of smarter buildings will get better visibility into building’s functions, such as how much water and energy they are using. Most businesses and residents now find this out by looking in their rear-view mirror—the previous month's utility bills. With smart meters, residents and businesses are getting closer to real-time views into their actual usage. With smarter buildings technology, building managers have a cross-building view into actual performance of all systems so they can make adjustments and repairs when needed, a key step when looking at large facilities, campuses and cities. Using analytics provides deeper, X-ray vision into what's happening in real time. As buildings and cities are instrumented, managers will rely more on analytics to flag outlying behavior and to recommend optimal settings for heat, water and other facility maintenance. Predictive maintenance will become condition-based. At its 3.2-million-square-foot Rochester, Minn., campus, IBM integrates data from more than 300,000 data points, consolidating it into a common repository for effective analytics. Through this solution, the Rochester facility cut energy use by 8 percent, on top of the 6 percent reduction already being driven through aggressive energy-improvement programs. Applications that pull data from a building and a city's "Internet of things" will proliferate. Parking applications can help drivers find available parking spots, for example. But it goes beyond that. The Internet of things gives people information, the first step toward making change. Through the increasing connectivity, people can act as living sensors to provide data and feedback to make changes and create smarter cities and buildings. For instance, some cities are extending that Internet of things to city services such as enabling citizens' to alert cities to potholes, graffiti and water issues by taking photos and sending them to city management, where they can be prioritized and dealt with. Cities are using geospatial intelligence to send crews with the information they need and the overview of where the projects are to map out the best driving routes. Building managers will order from a menu of energy, allowing them to choose energy by source and/or cost. Just as shoppers can chose which type of produce they want based on cost and source, city and building managers will be able to do the same with energy sources. With smart meters, building occupants know how much energy they are using. However, organizations in the future will also be able to choose the source of their energy. If they have carbon footprint targets to meet, they can decide to get 30 percent of their energy from renewable sources like solar and wind. If that gets too costly, they can shift more to natural gas. A company's finance/real estate team is evolving into a smarter buildings team. In the next few years, accounting changes will require all publicly traded companies to add billions in new assets to their balance sheets. As organizations begin to itemize all their property assets, they'll also look into ways to reduce costs. What they're discovering is that by learning how their buildings are wasting energy, they are finding new ways to cut costs and reduce their carbon footprint. The cost of energy use in New York City municipal buildings totals more than $800 million each year and accounts for about 64 percent of the greenhouse gas emission produced by government operations. With carbon intelligence software, the city is aiming to reduce its greenhouse gas emissions 30 percent by 2017. I felt the earth move last week, even though I was hundreds of miles from the epicenter of the earthquake. It was a reminder of the near certainty that there will be a major, devastating earthquake in the US in the near future. We all know that individuals, businesses, and institutions must plan for earthquakes and other disasters, building product manufacturers can also plan ahead. As the map shows, earthquake (and tsunami) opportunities are not just for the West Coast market. Indeed, faults in the Midwest and near large population centers of the East Coast are more vulnerable to loss of property and life. Advances in building standards usually occur in response to natural disasters. As scientists, underwriters, and policymakers study the lessons learned from quakes in Haiti, Chile, Mexico, and Japan, more stringent building codes are likely to emerge. But there is no need for you to wait until then. Now is the time to take a fresh look at your product offering to determine if your products can help create safer buildings. Give me a call if you want to discuss your opportunities; your initial call is always free. I look forward to hearing from you. This is an encore of an article by Michael Chusid that was first published over a decade ago. The specific examples cited are no longer accurate, but the principles remain the same. An awareness of building product trends can contribute to an architect's ability to stay in the forefront of design and technology. The marketing concept of "product life cycle" provides a useful tool for this. By evaluating where a product is in its life cycle, an architect can anticipate changes in its availability, recognize new channels of promotion and distribution, assess the risks associated with its use, and make sense of the rapid evolution and introduction of new products. Product life cycles are typically divided into four phases based on sales performance, and form a characteristic "S"-shaped curve. The introduction of a new product is marked by slow sales growth. It takes time to train salesmen, build distribution channels, overcome reluctance to change established behavioral patterns, and get the new product into the specification pipeline. Manufacturers must identify innovative customers and work closely with them during this phase to persuade them to give the product a trial. Because of heavy start-up costs and promotional requirements, little or no profit is realized by a manufacturer during this phase, despite typically high prices. Intelligent building systems are in this introductory phase. During the growth phase, a product obtains rapid market acceptance and improved profitability. "Where has the product been used?" is a question architects often ask, and in this phase the majority of firms will follow the lead of the early-users. Increased demand will stimulate competitors to introduce new product options. Although manufacturers continue to provide high levels of promotion, prices tend to remain stable, while profitability increases as the cost per sale drops and the economies of production increase. Exterior insulation and finish systems are in such a growth phase. Mature products are marked by a slowdown in sales growth and profitability. Market saturation occurs when the product has been accepted by most of its potential buyers. Sales volume is affected more by the level of construction activity than by sales activities, and manufacturers may reduce their sales force to control expenses. To maintain market share, manufacturers cut prices, look for market niches to exploit, and make other modifications to their product or marketing mix. Most building products are mature, and basic materials such as gypsum board are "commodity" products with little or no difference among manufacturers' products. As a product starts to decline, sales and profits erode. Architectural porcelain on steel was once a popular material for service stations and curtain walls, but faced with changing tastes and improved organic coating systems, demand for the product has declined dramatically. Such a product can often obtain a rejuvenation as a result of major improvements, new channels of distribution, or changes in fashion. Glass block is a dramatic example of a product repositioning. Popular in the 1930's and 1940's, glass block declined in sales as insulated glass and fluorescent lighting gained in popularity. The last U.S. manufacturer was ready to close its plant, but recognizing that a new generation of designers was finding new aesthetic and functional uses for glass block, the company repositioned the product and dramatically increased sales. Within many product categories, various items may be at different phases of their life cycles. In roofing, for example, low-pitched, standing seam metal roofs are no longer limited to pre-engineered metal buildings, but are being introduced as an architectural product. Modified bitumen roofing is still in a growth phase, single ply roofing has matured, asphalt built-up roofing is declining, and coal-tar built-up roofing is attempting a rejuvenation. Among glazing materials, fire-rated ceramic glazing has only recently been introduced, and low-emissivity glass is growing in sales. Sales of insulated glass remain strong, but it is a mature product since it is already used in most building types and climates. And plain float glass is declining in use as tempered, laminated, and other specialty glasses have seen a rise in popularity. Product life cycles also influence specification writing. When a product is new, extra care must be taken when investigating it for a particular project. Performance or descriptive specifications are appropriate at this stage to clarify exactly what is required. During a product's growth phase, proprietary specifications can be used because advertising will have built widespread awareness of it. And since the product's initial success will frequently have encouraged competitors, "or equal" specifications become feasible. As a product matures, industry standards typically emerge, allowing the use of reference specifications. As a product declines, brand loyalty deteriorates and the product becomes increasingly prone to substitutions. The rate at which building products are introduced and the speed with which they grow, mature, and decline continues to increase. Building products do not cycle as quickly as many types of consumer goods or high tech industrial products like electronics. Still, almost every category of building materials goes through a complete cycle several times during an architect's career. In many instances, the pace is even faster. As recently as two years ago, for example, high performance water repellents based on silane and siloxane were still in their introductory phase. Only a few brands were available, the price was relatively high, and distribution was often limited to qualified applicators. Heavy sales promotion was required to differentiate the product from acrylic sealers and other pre-existing types of water repellents, and to interest innovative specifiers likely to give the product a trial. Since then, the silane and siloxane water-repellent market has changed so rapidly that it appears to be entering its mature phase. A key factor in this has been the publication of a federally financed research report establishing criteria for water repellents. This test demonstrated the effectiveness of silane and siloxane water repellents, stimulating increased demand and a proliferation of manufacturers and private brand labels. As competition increased, prices fell and suppliers shifted their emphasis from promotion to cost-efficient distribution. Brands now struggle against each other to create niche markets and other competitive advantages, and mergers and other forms of market consolidation are occurring. Meanwhile, research and development continues on new types of water-repellent chemistry. While silane and siloxane products may not decline for a number of years, I would not be surprised if a new product type starts the cycle over again in the very near future. LEED and other recent environmental initiatives have increased the construction industry's awareness of recycled content in building materials. However, finding alternative uses for industrial "waste" is not a new concept. 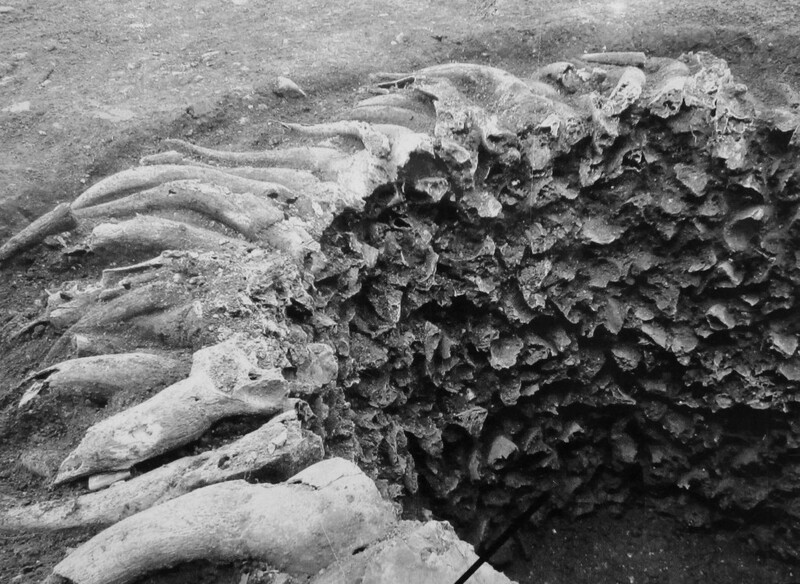 This is made clear by recent archeological excavations in London that reveal how the bone core of horns were used as masonry units. After the Romans settled in today’s London, Aldgate surroundings (eastwards from the city wall) were turned into a cemetery. But in the Post-Medieval period, Prescot Street was transformed from an essentially rural situation on the fringe of the City, into a densely populated central district. Among the on-going archaeological excavations at this site, a horn core pit has been discovered, showing the intense industrial activity in the area. 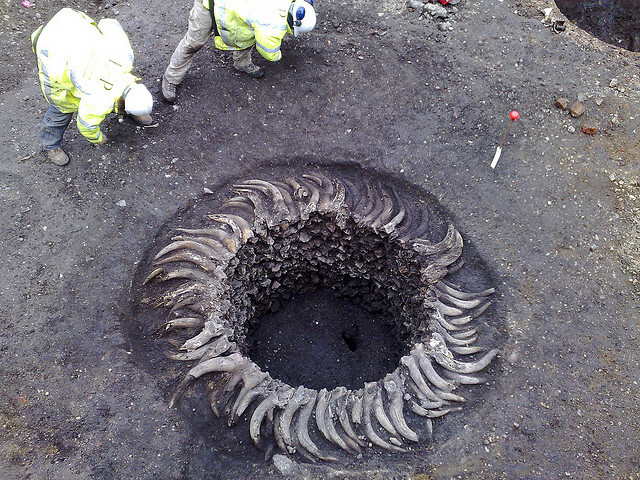 Underlying the basement slabs were large deposits of Post-Medieval soils that had been truncated by two large soak-aways and one small, and a horn core pit constructed from the horn cores of long horn cattle. This is significant because ‘horning’ was once an important industry in the area... ‘Horners’ were skilled craftsmen who worked horn from cattle to create a range of artifacts from drinking vessels to buttons, and from panels in lanterns (when sliced very thinly) to tool handles. What would it take to get an ICC-ES Evaluation Report on such a construction material today? Building product salesmen can make an important contribution to an architect's practice. While they must tout the benefits of their products and take orders salesmen also offer valuable services: providing information with which architects can evaluate, select, and specify products; introducing architects to new materials and techniques; helping assure that contractors understand the specified products and that the products are installed correctly; and providing trouble-shooting assistance to avoid or resolve problems during design and construction. By understanding building product salesman and the work they do, an architect will be able to make better use of the resources they may offer. It takes a special type of individual to sell building materials. A salesman must have a professionalism that matches that of his architectural clients, a complete grasp of his own products and at least a basic understanding of design and construction technology. Building product sales require a much longer time frame than do many other types of sales. A building product salesman must often make repeated sales calls before gaining the trust of an architect, and then must wait until the architect has a project for which the salesman's product is appropriate. And after getting his product specified, the salesman's "sale" might not be completed until many months later when a contractor places an order. Because the salesman must promote his product to each of the many decision makers involved in a typical architectural project, from designer and engineer, to specifier and job captain, to contractor and building owner, a salesman who expects to turn a "cold call" into "cold cash" in just a single sales presentation in not likely to find satisfaction in construction product sales. Recruitment, training, and motivation of salesmen is a constant challenge for all building product manufacturers. There are several types of business relationships into which most building product salesmen can be categorized. These categories affect the range of products and services a salesman offers, and his style and motivation for doing business. The company salesman is an employee of a manufacturer. Obviously, this type of salesman is limited to promoting the products of one company. A company salesman may be commissioned or salaried, but in either case is expected to promote his company's reputation and long term goals in addition to making immediate sales. By comparison, the manufacturer's agent is independent and usually represents several manufacturers. Agents typically do not stock materials, but place orders with their manufacturers and provide local service to customers. Frequently, they are paid a commission only on sales delivered to customers within their territories. This means that if an agent in Chicago, for instance, helps an architect specify his product on a project in Dallas, there may be no commission for servicing the architect. Distributors are also independent, but usually maintain an inventory of selected products. instead of getting a commission, distributors generate income by purchasing materials at a wholesale discount and marking up the price. One reason many manufacturers use distributors is to pass to the local level the onus of providing contractors with goods on credit. Architectural catalog services are becoming more common in some parts of the country. These services are retained by a number of manufacturers to periodically "detail" the architectural offices in an area by updating their catalogs and making brief presentations about new products. The salesmen also collect information from the offices they visit about the types of projects on the boards and whether an architect would be interested in more information about a product. Frequently, architects will also rely on trade contractors for product information. Contractors can add the extra benefit of knowing how products actually perform in the field can include installation costs in the prices they quote. Not all building product salesmen are trained to service architects. Many "countermen" for example, inside salesmen who process orders, do not know how to respond to the design and engineering-oriented questions typically asked by an architect. To provide recognition to building product salesmen who have demonstrated an understanding of specifications and other construction documents, the construction Specifications Institute started their certificate Program last year. The written exam for this program is similar to that taken by Certified Construction Specifiers. By cultivating relationships with good salesmen - salesmen who are both knowledgeable and responsive - an architect can avoid countless hours of costly product research, assure himself of an up-to-date catalog and sample library, obtain assistance in detailing and specifying, and call upon their experience and product knowledge whenever help is needed. This is an encore of an article Michael Chusid wrote over 20 years ago. Since then, several AAC producers have attempted business in the US, and most have failed. While it is still an outstanding building material, I suspect that newer building systems on the market make it less likely that AAC will become a major product in the US. But I would love to be proven wrong. Autoclaved Cellular Concrete (ACC) [now known as Autoclaved Aerated Concrete (AAC)] is a precast concrete foam that can be used for building blocks and panels. ACC is not produced or readily available in the United States or Canada but is a major building material throughout most of the world. As North American architects and builders increasingly compete in a global market, the domestic construction industry must consider building materials such as ACC to meet the construction needs of this country. Indeed, increased attention in the United States is already being focused on ACC: Planning is under way for ACC factories in Florida and New Jersey. Several other entrepreneurs and foreign companies are actively investigating U.S. manufacturing or importation of ACC. A major materials company was close to a commitment to build several ACC production facilities in the U.S. until it redirected its plans last fall. West Virginia University, which has formed an ACC Study Center to act as a clearing-house for information, attracted over 50 interested parties to a national conference on ACC last November. And several demonstration projects have recently been constructed in the U.S. Further laying the groundwork for ACC here has been the evaluation of the material by the Council of American Building Officials and HUD. Other building code approvals are pending. To produce ACC, a slurry of Portland cement, lime, silica sand or fly ash, and water is mixed with a small amount of powdered aluminum and poured into molds. The aluminum reacts chemically to release millions of tiny hydrogen bubbles that expand the concrete to as much as five times its original volume. Within a few hours, the concrete foam cures enough to be stripped from its mold. It is then sliced into blocks or slabs of the required size and steam cured in an autoclave. Because it is fully hydrated, ACC is more dimensionally stable than conventional concrete. In fact, ACC turns to rock, forming microscopic crystals of the mineral tobormorite, a form of calcium silicate hydrate. What makes ACC attractive as a building material is its unique combination or properties. 11 is light weight, thermally efficient, fire resistant, durable, and load beating. ACC is typically produced at densities as low as 35-pounds-per- cubic-foot, less than that of wood. Its myriad small cells result in a thermal conductivity of about 0.8 Btu/ft2(hr)F/in thickness, significantly lower than conventional concrete or masonry; in mild climates, ACC walls or roof decks may require no additional insulation. ACC also is noncombustible; partitions only three inches thick can provide an amazing three hours of fire resistance. ACC is relatively inexpensive to manufacture and erect, with installed costs estimated to be lower than most comparable building systems. ACCs light weight not only reduces structural dead loads, it can also boost productivity because larger blocks or panels can be lifted and placed without heavy equipment. Although large ACC blocks are fabricated with handles for easy lifting and fast erection, blocks can be used in the same !trays as conventional concrete masonry and laid with either thin mortar beds or surface bonded construction techniques. For panels, steel reinforcing is placed in the molds. Panels are factory cut to length and capable of any special edge or surface treatments. They can be used for exterior single wythe walls and cavity walls, fire rated partitions and shaft walls, and roof decks. Compared to other types of walls which m u a h assembled from any components, prefabricated ACC panels offer structure, insulation, fire protection, and weather resistance all in one piece. ACC also can be easily cut to fit field conditions using conventional hand or power tools. Wiring can be run in ACC without conduit by drilling or routing raceways in the material. While the material can be exposed to weather, it readily accepts a variety of finishes including paint, stucco, synthetic plaster, ceramic tile, and thin brick or stone veneer. Because it can be cut so easily, the material also can be sculpted to form bas relief, ornament, graphics, and other architectural embellishments. Sculpting can be done either in the factory. Japanese firms, for example, produce ACC panels with a wide range of geometric surface patterns. And the ease with which custom designs can be executed will undoubtedly improve as the designers' CAD system is linked directly to the manufacturers' numerically controlled computer-aided manufacturing system. ACC shares its ability to be shaped with the plastic foam used in exterior insulation and finish systems (EIFS). However, more elaborate shapes are possible with ACC because it does not need to be wrapped in fabric mesh. ACC is also similar to EIFS in that both are light weight, insulating, and economical. But ACC does not present the fire hazard of plastic foam, has fewer separate components to assemble, and is more durable. ACC is a "structural insulation and finish system." ACC was produced as early as the 1920s, but it was after World War II that its use rapidly increased. Commercialized first in Sweden and Germany, it spreads to the rest of Europe and then around the world. Today, over 200 plants in at least 35 countries produced more than eight billion cubic feet per year. The only North American Plant is in Mexico City, although a plant operated in Montreal during the 1970s and produced several hundred buildings. Buildings built with material from the Mexico City and Montreal plants have held up well and provided evidence of ACC'S performance in varied North American climates. Several ACC projects have been constructed recently in this country using imported materials. These include two projects in Florida: an office and factory for a Swedish firm and a housing prototype for a German developer. Another recent project for Consolidation Coal Company used ACC blocks in an underground mine to partition tunnels to create ventilation shafts. A primary advantage of ACC in the mine was that the blocks could be moved into place easily and with minimal risk of back injury. But if ACC is such an outstanding building material why isn't it already widely used in the United States? This question has been asked for so many decades that it has fostered an atmosphere of skepticism which may be ACC's single biggest hurdle to overcome here. The answer sheds light on the marketing and economic forced that shape the palette of materials available to contemporary architects. Complete with autoclaves and the automated equipment to slice the loaf of green concrete into blocks and panels, an ACC factory costs an estimated $10,000,000. Because ACC is bulky to transport, each plant has only a limited market area from which to recover the initial investment. In this country, ACC not only faces an unknown market demand, but solidly entrenched competition from concrete masonry, metal building panels and roof decks, precast concrete, EIFS, gypsum board partitions, and other materials. The missionary work required to gain acceptance for a significantly different building material can take years these factors exceed the risks most investors are willing to take. Coming changes in society and construction, however, appear to favor ACC's unique characteristics. For example, the construction industry is facing a growing shortage of skilled labor, which could favor prefabricated and easy-to-install ACC panels over field-fabricated masonry. Throughout most of our young country's history, wood has been to separate buildings with open space. As our country matures, however, the greater permanence and fire resistance of ACC may be in greater demand. And the growing desire to compete around the world, plus the cross-fertilization between U.S. designers practicing abroad and foreign developers working in the U.S., will undoubtedly continue to stimulate interest in ACC. Another reason why ACC is attracting more attention is that it is an environmentally friendly material. ACC is inert and non-toxic. It is produced with environmentally sound, low cost, and readily available raw materials. In fact, by using fly ash, a waste product of coal-fired electrical generators, ACC even mitigates a solid waste disposal problem faced by electrical utilities. Manufacturing requires relatively small amounts of energy and does not release pollutants; scrap can even be ground and put back into the mix. Since it does not burn, ACC does not release toxic particles of combustion nor does it contribute to indoor air pollution problems. On the contrary, ACC allows vapors and concentrations of other gasses to diffuse through its cellular structure and has been endorsed by European environmental agencies, including the Federal Association for Healthy Building Products and the International Institute for Healthy Construction. Environmental concerns about plastic foam and fibrous insulation materials are other reasons to consider ACC as an alternative to currently used materials. As with any unfamiliar building technology, designers and builders will have to learn how to specify and erect ACC. And while ACC is a proven building system, it may have to be modified to accommodate domestic construction practices. For example, windows and wall penetrations must be carefully detailed to avoid the entry of water into the cellular concrete. But other foreign building technologies, such as single-ply roofing and EIFS, have been integrated successfully into domestic construction practice: ACC will eventually find a place here, too. Architects with projects overseas should use the opportunity to gain experience with ACC. It is a building material t. hat you will be hearing more about and should prove to be a welcome addition to the architectural palette. This is an encore of an article Michael Chusid wrote over twenty years ago. It has stood the test of time and is still relevant today. When it comes to building products, many architects have only a vague awareness of the effort required to produce, market, and distribute the bricks, carpet, windows, and thousands of other products they consume. Architects shop in a supermarket of product advertisements and sales representatives, specify from a menu of manufacturer catalogs, and have a feast spread before them at their construction sites-but they seldom enter the kitchen. A better understanding of the organization, activities, and concerns of the building product industry would enable architects to design with and specify building materials more astutely and effectively, and would strengthen their ability to lead the design and construction process. Architects frequently identify three principal members of the design and construction team-owners, architects, and contractors- but overlook the building product industry. While building product manufacturers may not be prime contractors on typical architectural projects, they still play a vital role in the building process and have a significant relationship with all three principals of the owner/architect/contractor triad. Producers have a direct and contractual relationship with contractors, selling them materials and products and providing them with training, credit, and other types of support. Producers can also have contractual relationships with building owners, especially on projects involving maintenance or rebuilding. But even in architecturally specified work, producers may still have direct relationships with owners. Many developers now list preferred building material vendors as part of their corporate building standards or procurement programs, often the result of manufacturers having established relationships with owners. And since many of the building product manufacturers' warranty obligations pass directly to the building owners, producers can also have relationships with owners that survive the final punch lists. The relationship of the building product industry to the architectural profession is more complex. Just as a painter can be known for the palette of colors with which he creates his art, so too is an architect dependent on the palette of building materials available to him. The range of materials available today is larger than it has ever been. This is primarily the result of manufacturers, driven by competition, having to continually create and exploit new technology, respond to and stimulate market demand, and develop and promote new products and markets. Where once an architect was limited to locally available materials, today the palette of building materials comes from manufacturers around the world. Instead of building with raw or semi-finished materials, we assemble buildings from components that are shop fabricated and finished. Master builders with a personal knowledge of all building materials and methods are an endangered species; designers and builders must now rely on manufacturers' product data sheets, shop drawings, installation instructions, field training and supervision, and off-site fabrication. Many building products require such specialized experience or knowledge that they can only be detailed or installed by the manufacturer. The building product industry today is more than just a material supplier; it plays an integral role in detailing, engineering, and constructing systems, sub-assemblies, and entire buildings. After developing new technology and products, the building product industry must then introduce it to the rest of the construction industry. Through advertising, promotion, sales, and service, manufacturers must inform and educate designers and builders and provide technical assistance and support to users. The front line in that effort is the legion of building product salesmen and manufacturer's representatives, who act as consultants to architects. The building product industry also influences architectural style and taste through advertising and marketing. Which came first, for example, th e current design trend towards stone-veneer curtain walls or the development of new types of curtain wall systems and the technology to cut thin stone? In a profession that turns out more graduates each year than can be routinely absorbed, architecturally trained students are finding that the building product industry is a major source of satisfying career opportunities. Positions in building product sales, product development, contract administration, and management await talented individuals who can speak the language of architecture. There is not a standard way by which we can accurately measure the output of the building product industry. But it is clear that more than construction jobs are at stake when economic indicators point to an increase or decrease in construction. From the forests and mines where raw materials are extracted, and the refineries and mills where basic materials are produced, to the factories and shops where products and systems are fabricated, the building product industry is responsible for a significant part of the gross national product. By becoming more familiar with the building product industry, architects can become better informed consumers and more effective practitioners, able to call upon-and utilize the resources of the building product industry. This is an encore of an article Michael Chusid wrote 20 years ago. At the time, many assumed the US would make a complete transition to metric. It hasn't happened. However Federal government projects are designed and built in metric, and US firms working overseas have had to become proficient in SI. Lead the way in the conversion effort and customers will follow you. The current move toward metrics adds a new dimension to construction product marketing. Many manufacturers already have integrated metrics into their operations, while others see conversion as a stumbling block. Successful marketers will not only adjust, but will use the transition to create new competitive advantages. Metrication will immediately benefit firms who are expanding into international markets. A uniform system of measurement will allow those firms to move toward more consistent products, packaging, and standards worldwide. International trade, however, is just one area in which marketers can capitalize on metrics. Opportunities lie in areas ranging from customer relations to product positioning. By being the first in your product category to embrace metric, your firm gains a "first- mover" advantage. If you strongly link your products with metric, customers will continue to bring you their metric requirements even after other players have entered the game. Being the first mover does, however, entail added costs. Some manufacturers, particularly those that do not target public work, may prefer to wait until demand for metric-dimensioned products is more firmly established. But the public relations opportunities and the chance to define the standards for your product category may be worth the effort. In the short run, your customers face a period of uncertainty as they become familiar with the system and they learn how metric-dimensioned products work together. This is an opportunity to position your company as a resource. Your customers, still shaky in their own grasp of metric, will generally prefer suppliers who exude confidence over those who don't know a pascal (the unit of pressure) from a joule (the unit for energy or work). Reassure customers that you understand their situation and can provide the products and services they need. Make sure employees who deal with customers are fluent in metric. Your salespeople and customer service reps must show that your firm is experienced with the metric system, not only to assist customers but to respond appropriately to those who do. Hold training programs for those employees and provide them with electronic or slide-rule calculations. And don't overlook the value of the calculators as advertising specialties or premiums. Your printed materials also should signal your move to metric. Whether or not you resize your products to round metric units, you can incorporate metric equivalents simply and inexpensively the next time you reprint your product literature and labels. To attract attention, mark new catalogs with a logo or a banner proclaiming that metric dimensions are included. For existing products, list the English measurements first, followed by metric units in parentheses. For example: 30 Btu/hour (82.9 watts). For new products designed to metric standards, list metric units first, followed by English equivalents in parentheses: 1,000 kg/m (1,488 plf). New government standards require that contract documents and shop drawings be drawn to a metric scale. Floor plans, for example, can be drawn at 1:50 instead of the customary 1/4"= 1'-0". Manufacturers who provide tracing details to architects may want to publish two sets of details during the transition period. However, most computer-aided drafting programs can plot details at any scale desired. Shop drawings should be prepared with the same dimensioning system used in the contract documents. Merely listing the metric equivalent of a product is called a "soft" conversion. That's the easy part. A decision about whether and when to undergo a "hard" conversion, on the other hand, will probably be the most significant marketing issue you face. Hard conversion involves redesigning a product or construction method to metric dimensions in whole numbers. For example, 4x8- foot plywood, which measures 1,219.2x2.438.4-mm panels. New products should be designed in metric from the start. It may be necessary for you or your distributors to maintain inventories of both metric and non-metric sizes during the transition. Eventually, specialty businesses may emerge to provide old sizes for use in renovations. Though previous attempts to convert the construction industry to metric have failed, other U.S. industries have successfully made the switch. That fact, plus burgeoning international construction trade, will likely stimulate a slow but persistent momentum toward metric building products in the united states. The only remaining question, then, is the pace and extent of change in your section of the industry. I can only offer the adage. "Don't overestimate how much will change in five years or underestimate how much can change in 10 years." This is an encore of an article Michael Chusid wrote nearly 20 years ago. Some points in it now seem quaint (e.g., referring to "A/V" presentations instead of "Powerpoint", and sending a "letter" instead of an "email"). Other points have become even more important, such as the demand for continuing education credits. The cost of sandwiches is more than justified by the efficient use of your time at a lunch presentation. Such presentations expose you to a roomful of prospects in the same time it would take to make a sales call on one architect or specifier. The setting also lets you make a more thorough presentation and avoid the phone calls and other distractions that can occur when meeting in a prospect's office. Use lunchtime presentations to create product awareness and lay the groundwork for future sales contacts. This is especially useful with new products since lunch allows time to display samples, give an A/V show, and demonstrate when and where to use the product. This is not the time to close sales or discuss specific projects. Instead, emphasize your product's benefits and offer solutions to your prospects' common problems. With this approach, your audience will see you as a resource they can call on with confidence when specific project needs arise. The seminar-like format can also he used to teach product basics. If you sell admixtures, for example, use lunch to review the fundamentals of concrete technology or quality control. Younger audience members may not have learned this in school, and it can be a useful refresher for seasoned members. When new codes or regulations go into effect, you can provide a real service to your audience by explaining the implications. A door hardware consultant I know, for example, uses lunch presentations to explain how the recently enacted Americans with Disabilities Act affects the design of entrances. Such presentations contribute to an architect's continuing professional education. This is especially important in light of the American Institute of Architects' new continuing education requirements. Ask the architectural firm to designate a staff liaison to give you a head count and reserve the office conference room Your liaison also may be able to suggest local catering services. The menu can range from deli sandwiches and soft drinks to something more creative. But don't get so carried away with food that the menu is more interesting then your program. Request the firm's staff roster and send professional invitations yourself. Not only does this boost interest in your program, but you add the names to your prospect list. Your audience will arrive en masse at the beginning of their lunch hour and will leave at the end of the hour, whether or not you are finished. They will be hungry, so feed them before you start talking. While they're eating, ask them about current projects so you can tailor your presentation to their needs. If more than one person from your firm is at the meeting, don't sit together. Spread out among your audience. As an alternative to in-office lunches, you can hold a program at a restaurant or hotel, where you can attract prospects from several offices. This works if you want to reach firms too small to justify in house presentations or if your message is targeted to certain job titles, such as specification writers. Off site breakfast and lunch programs generally attract only managements level individuals who have more flexible work hours. After-house programs can be expanded to include open bars, entertainment, and special displays. At the end of the presentation, give everyone in the audience a brochure or other leave-behind piece. Those who are especially interested in your product will stay around to discuss specific projects. Allow time in your schedule so you will not be rushed. Pass around a sign-up sheet to get names or ask participants to fill out a short evaluation card before leaving. Then, follow up your presentation a week later with a letter or phone call. People learn more when they receive information via more than one sense, so use visual aids and product samples. Better yet, give participants a hands-on experience working with your product. A manufacturer of a new ornamental material, for example, passed around drawing paper and markers and gave the audience a building problem to solve using the new material. Quick sketch projects, or design charettes as they are called, can be an effective way for a designer to integrate information you have presented. Your luncheon may be one of the few opportunities for members of an architectural firm to talk to each other about your product. By facilitating interaction among your audience, you can help build consensus and support for your product within the firm. The best presentation i ever attended was for an electric water cooler, a product I though didn't need much explanation. The presenter began with a clean flip chart and marker. He had a box of coffee mugs imprinted with his company's logo and he offered one to anyone who asked a question or described a problem they'd had with his product type. To my amazement, the room came alive. One designer complained that he could never get the colors he wanted. A construction manager griped about coordination with related work. A project manager described the difficulty she had selecting appropriate substitutions. And a specifier asked about warranty limitations. During the exchange, the presenter passed out the mugs and jotted down the questions. He now had an attentive audience who knew why they were at the meeting. Rather than use a canned presentation, he used a well-organized slide show to answer the questions the audience raised. Everyone left the meeting with the sense that they had learned something they could use immediately, and with a coffee mug sporting the company's name and phone number. Your local reps can use these presentations to build relationships with prospects and can readily provide follow-up. Some manufacturers establish incentives to encourage their reps to make box-lunch presentations. Others prefer to use an expert from the home office. In either case, be sure that your presenter is an effective speaker. When appropriate, invite local distributors and contractors to attend the program. They will appreciate the additional exposure and it will assure prospects that your product is available and supported locally.